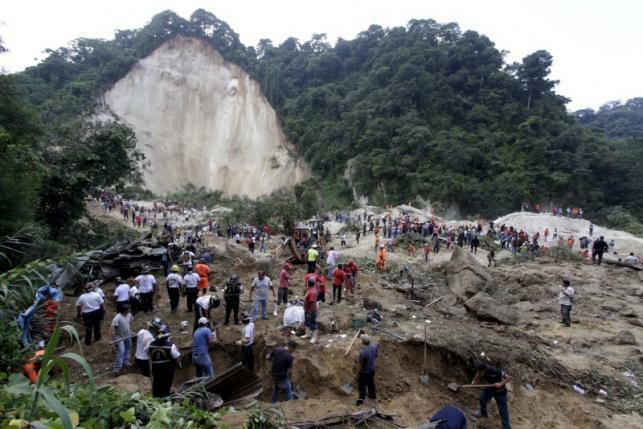 SANTA CATARINA PINULA, GUATEMALA – The collapse of a hillside onto a town on the edge of Guatemala City killed at least 25 people and left hundreds missing on Friday, as rescue crews searched for survivors in homes buried by dirt and sludge. “I feel like I’ve lost my loved ones because all my neighbors died,” said mother-of-three Melina Hidalgo, 35. “My husband is there now, shoveling through soil to find our son,” the domestic worker said, her eyes filling with tears. Oscar Raul de Leon and his family abandoned their home and he looked for his cousin, but all he found were the remains of the relative’s home.